Two talents are better than one for printmakers Tim Dooley and Aaron Wilson. Above: A print is gently peeled from the block for evaluation by artists Tim Dooley and Aaron Wilson. Working together, they explore a creative process that is complex and experimental. Andy Warhol and Jean-Michel Basquiat. Jasper Johns and Robert Rauschenberg. Marcel Duchamp and Luis Buñuel. They all dabbled in making art as teams, but those efforts didn’t define their legacy. For Cedar Falls printmakers Tim Dooley and Aaron Wilson, however, collaboration is fundamental to their work. Their prints capture a freewheeling exchange between two creative personalities who share both a common aesthetic and confidence in each other’s judgment. Wilson and Dooley met more than 15 years ago at the University of Northern Iowa, where both teach printmaking. They were invited to lead a digital screen-printing workshop at North Dakota State University in 2001, and Dooley suggested they make a collaborative print as part of the class. Other invitations for workshops, visiting artist residencies and exhibitions followed, and gradually the work that each created independently began to seep into the work of the other. “We began to think about the entire exhibition, not ‘this is my work and that’s his,’ ” Dooley says. Every new series begins with brainstorming ideas—say, “modern zombies, the walking dead of the fine art world,” says Dooley. Each artist makes multiple drawings that they scan into their computers and manipulate. They volley the digitized drawings back and forth, each adding, subtracting and changing the image. At that point, they may choose a strongly contrasting color, “to see if that finishes it,” Dooley says, “or ‘finishes’ it,” taking the print over the edge from provocative to … not so interesting. “You have to be willing to fail, basically,” Wilson says. The goal for each print is to have the layered images “disguise and camouflage each other and make this new thing,” Wilson explains. “We’re after this unsettling juncture, that kind of unsteadiness of the layering,” that gives each print a unique character. Dooley and Wilson see the technique as wedded inextricably to the content of the prints. Silk-screen printing is a mechanical process associated with commercial graphics, T-shirts and posters, and is therefore an ideal means of producing work based on cultural clichés. They deliberately choose subjects from popular culture that engage them as both fans and critics—Big Foot, unicorns, “Real Housewives,” for examples. “It’s hard to make fine art out of this kind of populist subject matter,” Wilson says, but that’s part of the challenge. The influence of Andy Warhol is hard to miss; he was the first to capitalize on screen printing and kitschy themes to erase boundaries between high and low art. Wilson and Dooley explore similar territory, but from a different point of view and with different goals. 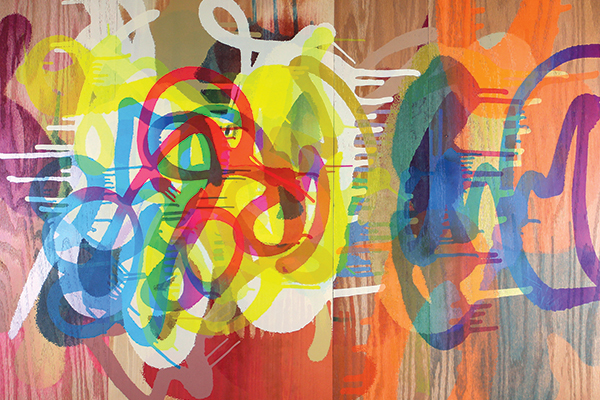 Their newest body of work, “Cut Ups,” involves relief printing rather than silk screen. Inspired by the drips and ink blots of their “Futile Gesture” series, the duo turned the gestures and drips into an image that could be cut from wood with a laser cutter. 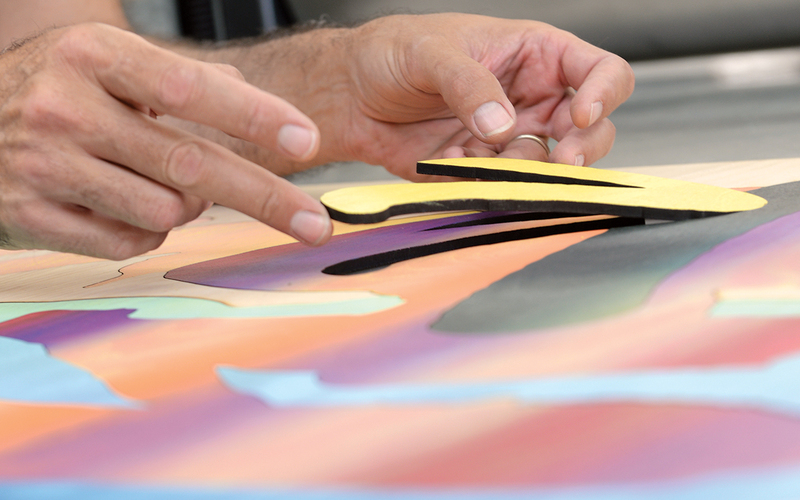 The printing “block” is essentially a jigsaw puzzle of shapes that can be inked separately with one or more colors before the block is run through the press. 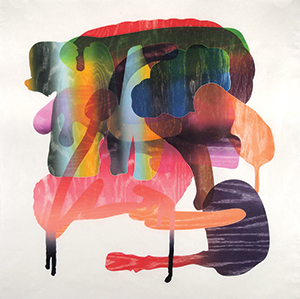 As with the screen prints, Wilson and Dooley build layers of transparent color with multiple passes through the press. 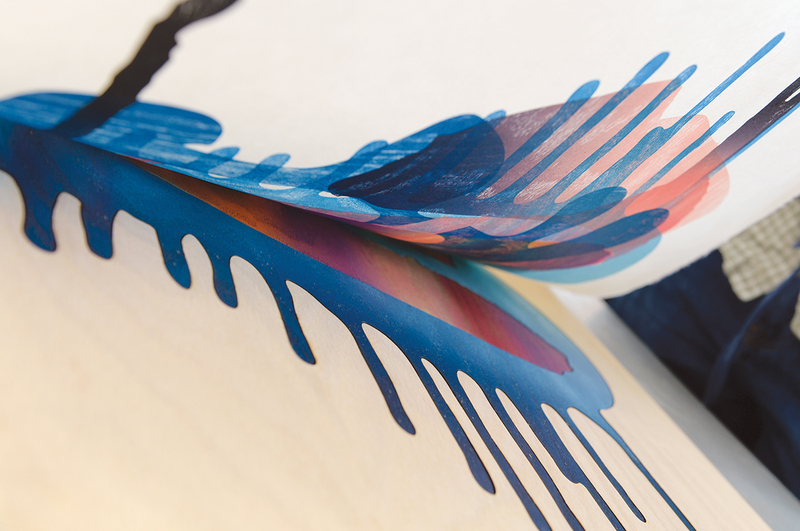 In addition, they use a variety of rollers to apply multiple stripes of ink at one time, creating what they call super-blends—as many as 20 colors side by side on the roller, so that when the inks are spread onto the wooden shapes, the colors grade into each other, creating a shimmering effect. Applied over a woodgrain pattern, the prints suggest 17th-century Japanese woodblock prints and German Expressionism without actually quoting either. With so many layers of both ink and paper, “it is incredibly simple to ruin them,” Tim Dooley says of the work he creates cooperatively with Aaron Wilson. An example of screen-printed layers applied to a wooden panel, a medium the duo find intriguing. When do they agree that a print is complete? “When we feel challenged by it,” Dooley says. Like a piece of an unfamiliar puzzle, another shape is inked and delicately placed on a work in progress. 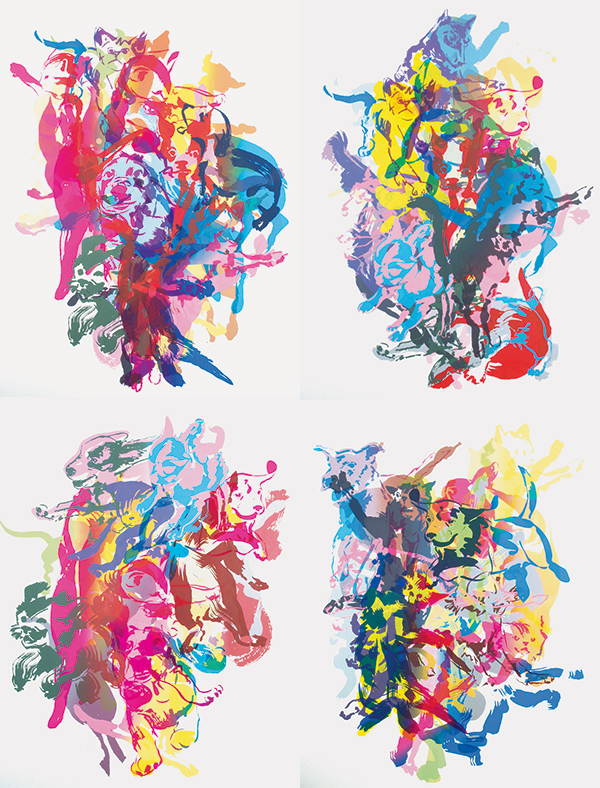 Four prints in a series called “Puppies vs. Kittens,” where playful layers of colors and forms deliver fascinating results. 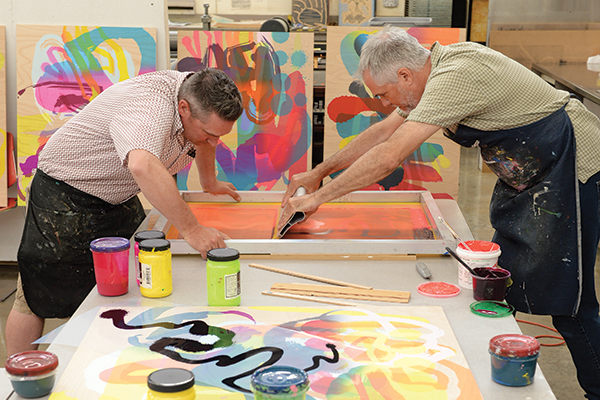 Aaron Wilson, left, and Tim Dooley at work in their Cedar Falls studio. Titled “M.W.P. 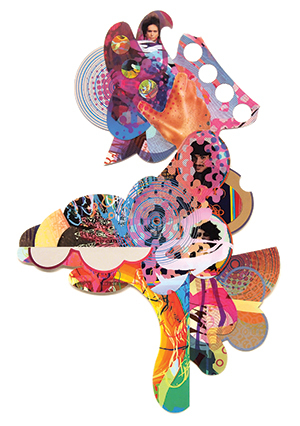 Remix #2,” this screen print collage measures 37×25 inches. It is priced at $1,200 at Moberg Gallery in Des Moines.